Intelligent space is one in which many networked sensors are distributed. The purpose of intelligent space is to support information for human beings and robots based on the integration of sensor information. Specifically, to support location-based applications in intelligent space, networked sensors must get locations of human beings or robots. To do so, sensor locations and orientations of sensors must be known in world coordinates. To measure numerous sensor locations accurately by hand, this study focuses on estimating the locations and orientations of distributed sensors in intelligent space – but doing so automatically. We propose map sharing using distributed laser range sensors and a mobile robot to estimate the locations of distributed sensors. 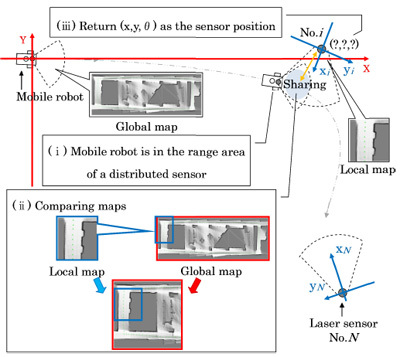 Comparing maps of sensor and robots, sensor locations are estimated on a global map built by SLAM of a mobile robot. An ICP matching algorithm is used to improve map matching among sensors and robots. Experimental results with actual distributed sensors and a mobile robot show that the proposed system estimates sensor locations satisfactorily and improve the accuracy of a global map built by SLAM. J. Lee and H. Hashimoto, “Intelligent Space – concept and contents,” Advanced Robotics, Vol.16, No.3, pp. 265-280, 2002. Y. Nishida, T. Hori, T. Suehiro, and S. Hirai, “Sensorized environment for self-communication based on observation of daily human behavior,” in Proc. IEEE/RSJ Int. Conf. Intelligent Robots and Systems, pp. 1364-1372, 2000. T. Sato, T. Harada, and T. Mori, “Environment-Type Robot System “Robotic Room” Featured by Behavior Media, Behaviour Contents, and Behavior Adaptation,” IEEE/ASME Trans. 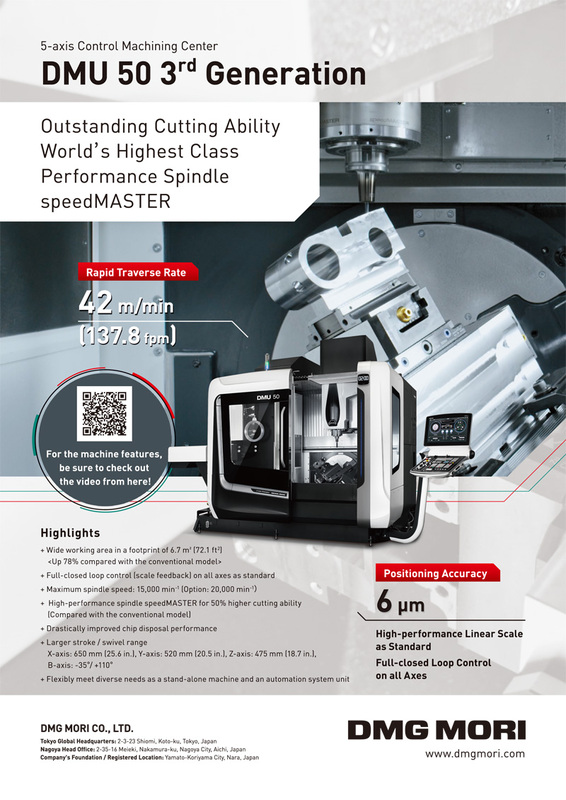 on Mechatronics, Vol.9, No.3, pp. 529-534, 2004. T. Sasaki, Y. Toshima, and H. Hashimoto, “Design and Implementation of Basic Framework for Integration of Robot Technology Elements in Intelligent Space,” J. of Robotics and Mechatronics, Vol.23, No.4, 2011. T. Jin, P. Podrzaj, and H. Hashimoto, “Position Uncertainty Reduction of Mobile Robot Based on DINDs in Intelligent Space,” IEEE Int. Symposium on Industrial Electronics, Vol.4, pp. 2603-2607, 2006. D. Herrero and H. Martinez, “Fuzzy Mobile-Robot Positioning in Intelligent Spaces Using Wireless Sensor Networks,” Sensors, Vol.11, No.11, pp. 10820-10839, 2011. J. Lee, K. Morioka and H. Hashimoto, “Mobile Robot Control in Intelligent Space for People Support,” J. of Robotics and Mechatronics, Vol.14, No.4, 2002. K. Morioka, J. Lee, and H. Hashimoto, “Human-following mobile robot in a distributed intelligent sensor network,” IEEE Trans. on Industrial Electronics, Vol.51, No.1, pp. 229-237, 2004. T. Sasaki and H. Hashimoto, “Auto-Calibration of Distributed Laser Range Finders Based on Object Tracking,” The 25th Annual Conf. of the Robotics Society of Japan, 1C21(1)-1C21(3), 2007. T. Sasaki and H. Hashimoto, “Calibration of Distributed Laser Range Finders using Mobile Robots,” ROMOBEC2007, 2A2-K01, 2007. S. Funiak, C. Guestrin, M. Paskin, and R. Sukthankar, “Distributed Localization of Networked Cameras,” The Fifth Int. Conf. on, Information Processing in Sensor Networks, pp. 34-42, 2006. C. Taylor, A. Rahimi, and J. Bachrach, “Simultaneous Localization, Calibration, and Tracking in an ad Hoc Sensor Network,” The Fifth Int. Conf. on, Information Processing in Sensor Networks, pp. 27-33, 2006. S. Thrun, W. Burgard, and D. Fox, “Probabilistic Robotics,” Massachusetts Institute of Technology, pp. 1-483, 2007. Y. Kasuya, F. Hashikawa, and K. Morioka, “An assistance system for construction of intelligent spaces based on the flexible communication among distributed sensors and mobile robots,” SICE System Integration (SICE SI 2014), pp. 514-517, 2014. F. Lu and E. Milios, “Robot Pose Estimation in Unknown Environments by matching 2D Range Scans,” J. of Intelligent and Robotic Systems, Vol.18, pp. 249-275, 1997. S. Yamanaka and K. Morioka, “Mobile Robot Navigation Using Hybrid Simplified Map with Relationships between Places and Grid Maps,” 10th IFAC Symposium on Robot Control, pp. 616-621, 2012.